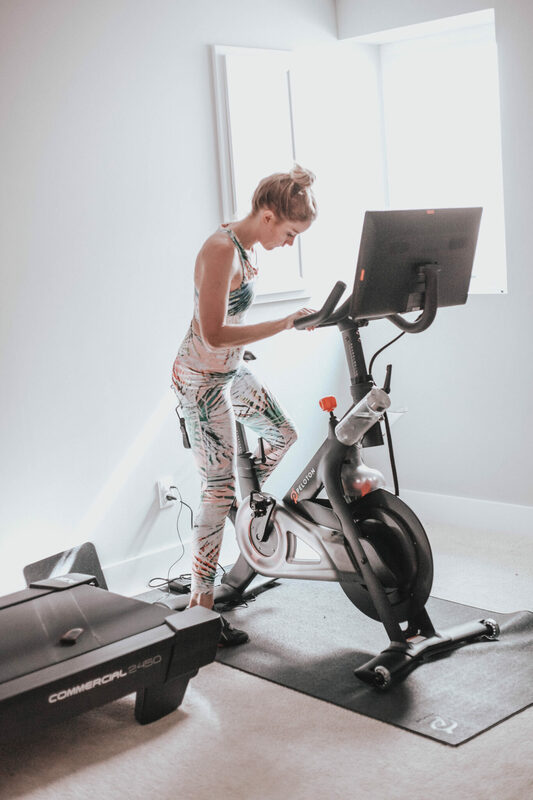 Peloton Review 2019 | Pros, Cons + Is It Right For You? Last week I shared one of my morning workouts on Instagram Stories – a Peloton class! So many of you had questions about it so I thought I’d share a full Peloton review! 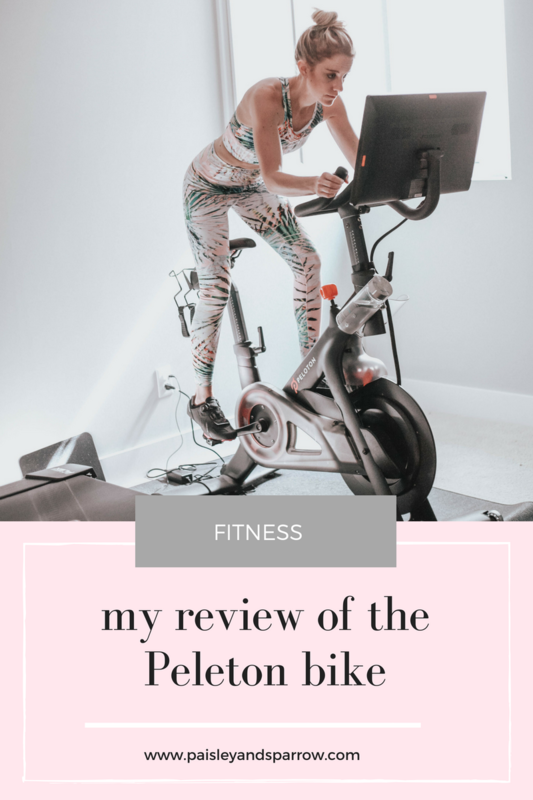 There are a lot of Peloton reviews out there so definitely check out others – I’m sure not everyone loves it as much as me! First off, what is a Peloton bike? Peloton is a private, indoor cycling studio in your own home. 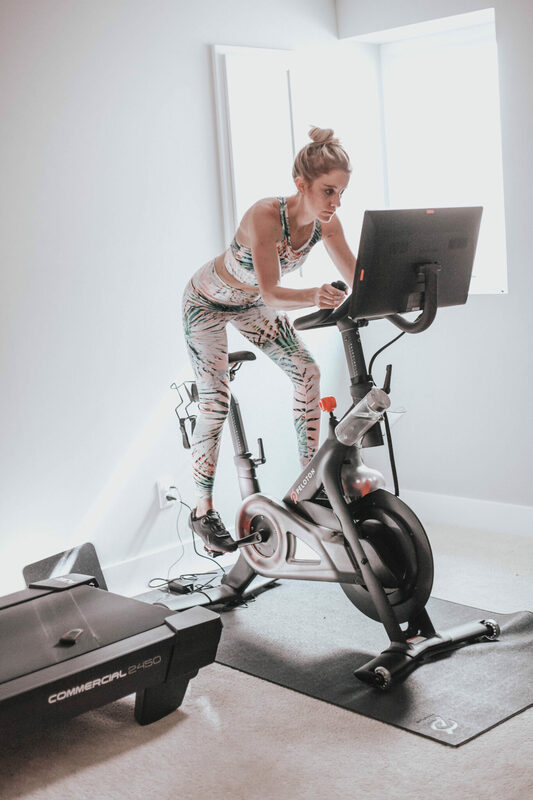 In basic terms, it is a stationary bike with a screen attached where you can stream live or pre-recorded classes to attend. If you tune in live, the instructors can see your name and your total output (among other things). You’ll frequently hear them give shout outs to online riders. I rarely do live classes so sadly I’ve never gotten a shout out. 😉 I have had friends who’ve gotten shout outs though! It’s always fun to hear a familiar name while taking a class. We first got our Peloton bike shortly after having Roy, our first born back in the summer of 2016. We knew our life was going to be turned upside down once a baby joined the family and that included easily heading out for a run or going to the gym like we were used to. Rishi (my husband) loves cycling and has done a few classes in his day as well as loves outdoor cycling. I truthfully hate it but we got the bike. I’ve never done a “real” cycle class though so I was open to trying it out. We have our basement bedroom converted into an “at home gym”. It has a treadmill, some weights and the Peloton bike. I go back and forth between liking workouts at a gym and workouts at home. But I have to admit, is so nice to have the option to do a workout at home! And now with 2 kids (and another one in tow), it’s really nice to be able to get a workout in and not have to worry about getting home in time for Rishi to leave for work. Rishi convinced me to try it out when we first got it. 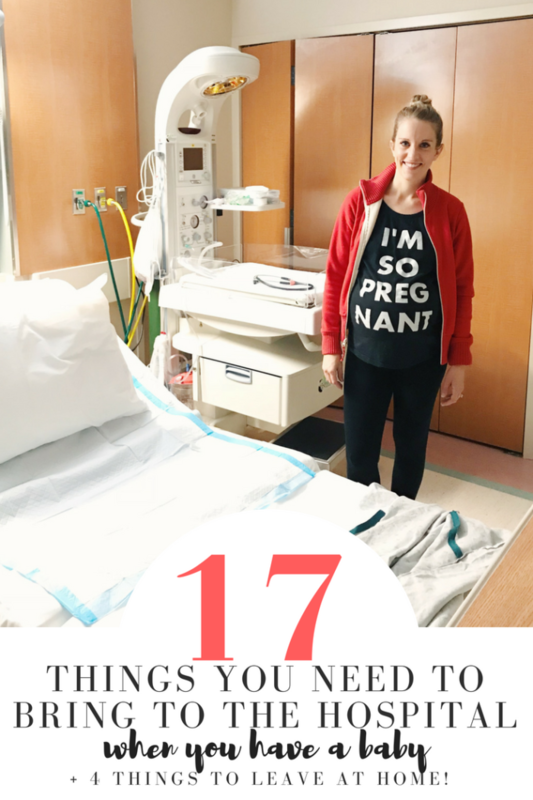 It took some getting used to (and I was really out of shape from being pregnant) but I loved it! It’s a really good workout and the instructors keep me super entertained, so I’m not bored 5 minutes into my ride. I typically only do a 20 or 30 minute ride but since they’re tough workouts I feel like I accomplished a ton in a short amount of time. They have 20, 30, 45 and 60 minute classes. The classes are all different types (HIIT, pop, intervals, low impact, etc). The cost of the bike starts at $2,245 which includes the bike, a 1 year limited warranty and delivery and set up. There’s also different packages which includes shoes, weights, headphones, heart rate monitor, bike mat, etc. I think it is definitely worth every single penny though! The treadmill that they recently came out with (and that I’m itching to get!) starts at $4,295 for the same thing (tread, a 1 year limited warranty and delivery and set up). I spoke to a rep recently who said Peloton is making the treads in batches so you need to put down a deposit and when the next batch is made (typically every couple of months), then your tread would be made and delivered. The Peloton Bike membership is how you stream all of the classes for the bike. This costs $39/month if you have the bike. You can also get the app and stream classes on your own bike or treadmill and it costs $19.49/month. I stream the treadmill classes on the treadmill we’ve had for years. It definitely not the same as using a Peloton treadmill but it’s nice to have the option to switch up my workouts! The subscription also has lots of added classes like stretching, core, total body, legs, etc. I should do more of the stretching ones pre or post class but admittedly I’ve only done a few. I’ve done quite a few of the strength classes though! Peloton has also recently added in yoga! There’s a variety of styles of yoga classes that you can do. I’m not a huge yoga person but I love doing a quick class every now and then. I try to do 3-4 classes each week. Since there are 20 minute options, it’s super easy to fit a class in first thing in the morning (and bonus, there’s zero commute time)! There’s also new ones added every week so I’ve never taken the same class twice! There’s definitely months when neither one of us touch the bike (I sadly couldn’t bike when I was pregnant with Penelope) but we try to keep it in rotation for our workouts. Lately I’ve been loving Peloton bike classes over going for a run outside since there is someone yelling at me and telling me what to do during the Peloton classes but not when I’m running. However, they recently released their treadmill so I’ve started streaming their tread workouts from their app while using our treadmill! This has by far been my favorite bonus of the Peloton workout since I love running so much. Now most weeks I do one treadmill workout and one cycling workout a week with one or two strength workouts. 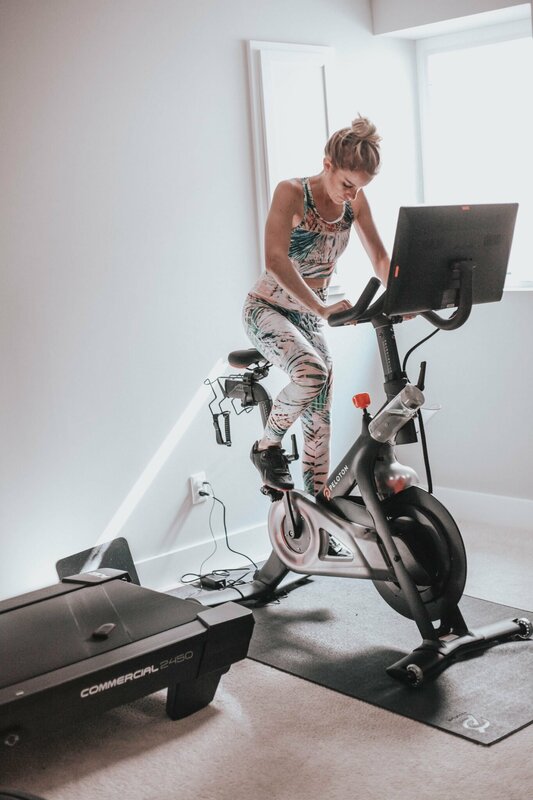 In true Peloton fashion, their treadmill workouts are amazing! They’re super good (and HARD) workouts that fly by. If you’re a runner you need to try these workouts out! The nice thing about the subscription is that it’s not just bike workouts! You can get all of your workout needs met with just one subscription (which is likely cheaper than your gym membership)! Cons: The Peloton bike is an investment. It’s an expensive bike and you need the monthly membership to stream classes. There’s less of an opportunity to meet other people like you could at a gym but they do give you ways to communicate with other riders. Pros: The subscription is multi-purpose – being able to stream so many additional classes like the tread workouts, strength workouts, yoga classes definitely adds value to the cost of the membership. There’s zero commute time to get to the gym. 1. Do you like to workout at home? You can be super competitive not only with yourself but other riders during a Peloton class. You don’t need to be a competitive person to like this workout but it definitely helps if you are one! 3. Do you like to do spin classes? If you’ve never taken one I suggest going to your local gym and trying out a few classes. Rishi already knew he liked spin classes where I was unsure – had it been just me I definitely would have tried out a class or 2! I also pick up this Gym and Fitness Equipment Wipes to wipe down both the bike and our treadmill after workouts. We spent a ton of money on these machines so I want to make sure that they stay in good shape! Being someone who wasn’t a huge biker before getting the bike, I’m pleasantly surprised with how much I love it. I’m also a pretty competitive person so this type of workout speaks to me. Let me know what questions you might have! Thanks so much for reading my Peloton review! 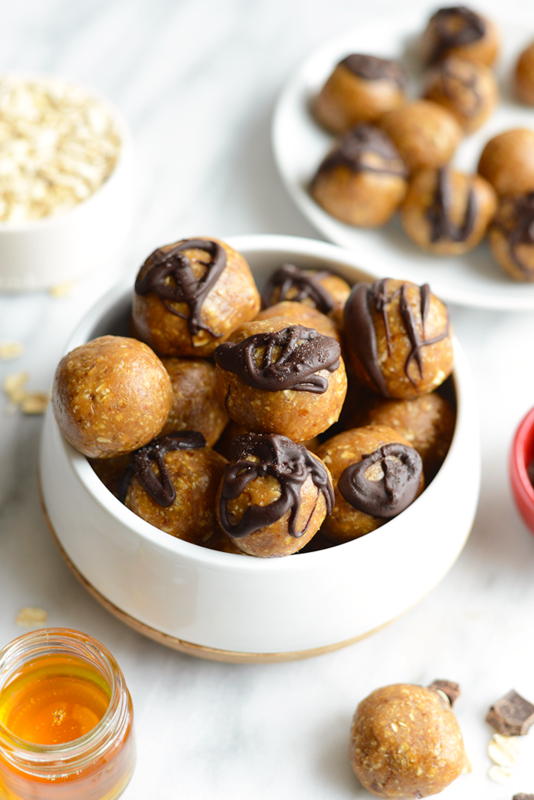 Be sure to check out My Kayla Itsines’ BBG Workout Review if you want to read other workout reviews! My wife was in New York and saw the Peloton store while she was up there visiting girlfriends. She was impressed with what she saw. I knew she was seriously looking for a solid workout machine for the house so I figured it would be a great gift and great for her transition out of post-partum (recent child birth). She got depressed after #1 and #2 so I was very motivated to help her however I could. When it arrived I was truly impressed. It has a very modern design, sleek. And very sturdy and well built. As nice (probably nicer) than any fancy bike you will see in a gym or studio. So far I have taken a class about two of every three days (for the last few months). Sometimes I do a live class, sometimes I do an “on demand” class. Just this morning, I woke at 650 and went downstairs and took a 45-min live class. Damn, I’m feeling good at work today. Pre-work classes always make me a high functioning, energetic team mate in the office. Always, I enjoy this bike so so much. On days when I’m feeling a little sluggish I’ll do a 20 minute class, when I’m feeling good I’ll do a 45 minute one. I burn around 250 calories for every 20 minutes I ride this bike (37yr old male), which to me is a solid result for my efforts. Besides tracking calories, you can track your cadence (rpm), resistance (how hard or easy you set it), your heart rate, and your output (a measure of cadence and resistance). Also, you can see how well you are doing against yourself (your previous rides), others, and even friends. For someone who is inspired by competition (like me!) this is the workout bike for you. As for my wife. Although we got the bike “for her,” we both use it equally. Some nights, after the kids are down, we head to the basement together and she does a 20-min ride while I do a stretch (peloton offers much more than just bike instruction), then we swap. For our stretch/yoga/strength classes that they offer, we just stream those to a TV from my phone. Of course whoever is on the bike is using the bike screen. One of us has to put on earphones, it’s sort of annoying if we are both listening to instructors at the same time. Doing this workout together has actually been something that’s improved our relationship through a like interest, comradery, and improving each of our overall feeling (mind body etc). She (“we” as most now say) just had a baby-our second. She recently told me this has helped her drop the baby fat faster than any other form of exercise in the past. Makes sense considering it’s primarily working your thighs and glutes which are the largest muscle areas in your body, resulting in a fantastic cardio workout. As for me, I have seen massive improvements in my lower body physique. Actually my upper body as well as I often take classes that mix legs and arm workouts in one session-all on the bike (peloton comes with weights and you pick between 1lb, 2lb, or 3lb). So bottom line we are both feeling energetic, healthier, and stronger. Which means (personally speaking), I’m feeling HAPPIER. Additionally, I play ice hockey and as the oldest guy on the team the bike has helped me regain some lost speed and strength. And most importantly, I don’t get winded after a long shift, which used to be the norm. All and all, I have NO ISSUES with this bike. Worst thing to happen so far is the heart rate monitor (which is wireless) has lost connection during a ride, but that didn’t matter much to me. Maybe it was even my fault, I don’t know. Anyways, feel free to reach out to me directly if you have any questions. I’m happy to answer anything I can. Also, my referral code is below. If you use it you will receive $100 off your bike (and I will get a coupon to buy peloton clothing apparel, woohoo!). All the best to each and every one of you.